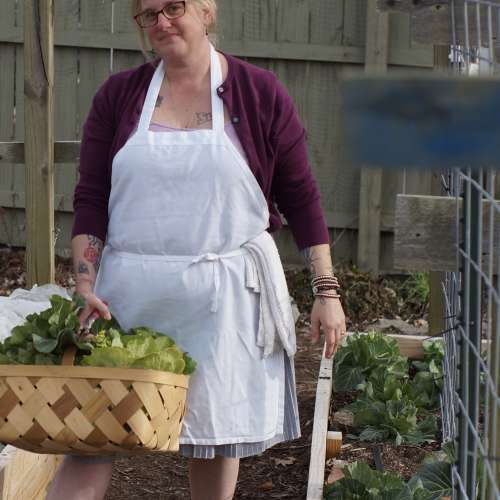 April Moon Harper is chef and co-owner of Sunny Point Café in West Asheville, North Carolina. She and her mother, Belinda Raab, opened the restaurant in 2003 - converting a long-time vacant building into a bustling neighborhood gathering spot serving award-winning cuisine. Prior to Sunny Point, April was chef at the original Flying Biscuit Café in Atlanta. April, a Waynesville native, studied culinary arts at Asheville-Buncombe Technical Community College and at the Culinary Institute of America. April’s love for cooking grows out of a childhood passion for baking, which blossomed into a deep appreciation for quality food created with farm-fresh ingredients. The importance of sourcing fresh, local produce is epitomized by Sunny Point’s on-site garden that is just steps from the kitchen. Even though the garden provides a small percentage of produce that the restaurant demands on a daily basis, the non-tangible experience customers have in experiencing the outdoor space is immeasurable. This dedication to showcasing fresh ingredients and allowing the pubic to explore and ask questions of garden staff is at the heart of Sunny Point's philosophy. Both April and Belinda actively work in the daily management and core decisions of running Sunny Point Café. April's two daughters, Emma and Hana, having grown up in the restaurant, are now management level employees participating in decisions and are key components to maintaining the quality of the customer experience.